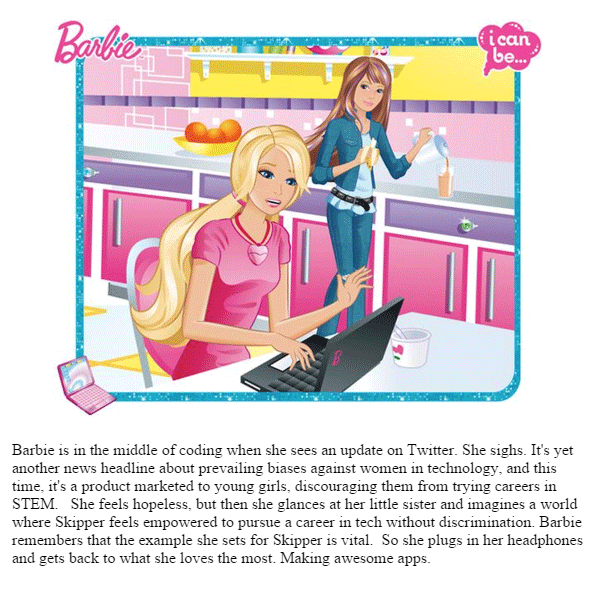 Barbie is in the middle of coding when she sees an update on Twitter. She sighs. It's yet another news headline about prevailing biases against women in technology, and this time, it's a product marketed to young girls, discouraging them from trying careers in STEM. She feels hopeless, but then she glances at her little sister and imagines a world where Skipper feels empowered to pursue a career in tech without discrimination. Barbie remembers that the example she sets for Skipper is vital. So she plugs in her headphones and gets back to what she loves the most. Making awesome apps.